Plan which sessions you want to attend in advance. Most conferences will put their timetables up on their website before the start of the event. Download the timetable and make a note of which sessions you are most keen to see, or any presenters who you especially want to hear talk. Then you'll have an idea how to structure your days around these must-see events when you arrive. Practice an elevator pitch. You'll need to get in practice at introducing yourself and your work, as it's likely that lots of people will ask you about what you do. To get comfortable with this, you can practice what's called an 'elevator pitch' – that is, a two minute description of what makes your work interesting and how your background prepares you for investigating your topic. Bring a small notebook. You'll probably have a phone and a laptop with you when you attend the conference. But it's very helpful to bring along a small notebook too, so that you can make quick notes while you are talking to someone. Wear comfortable shoes. You might find that you do a surprising amount of walking at a conference. Between getting from your hotel to the conference venue, walking between sessions, and going out in the evening for dinner or social events, you may well be on your feet all day. So make sure you wear shoes which are comfortable and won't cause you pain. Take business cards. When you meet someone with whom you have a productive discussion, you should take down their contact details so you can get in touch with them again in the future. You should also make sure that you give your contact details to them, and the easiest way to do this is by handing out business cards. Print a map before you go. It's easy to get lost in an unfamiliar city, and if your phone battery dies you can find yourself stranded. Avoid this problem by printing out a paper map marked with the location of your hotel and the conference centre before you leave for your trip. Do attend the social events. Social events such as dinners or parties are an important part of the conference experience as they give you a chance to talk with the other attendees in a more informal setting. So do make an effort to attend at least some of the social events as well as the talks and workshops. Don't be afraid to chat informally after talks. After a session, attendees will often gather outside the venue to chat about their opinions. Do feel free to join in, as you can learn a lot from an informal discussion with knowledgeable people. If there's someone you want to talk to, introduce yourself. Don't feel like you have to stand on ceremony all the time. If there is a particular person you'd like to talk to, you absolutely can walk up to them and introduce yourself. You don't need to wait to be formally introduced by someone else. If you admire someone's reseach or if you particularly enjoyed a recent paper of theirs, then tell them. Everyone likes to hear that others appreciate their work! Follow up with new connections afterwards. If you meet someone at a conference and exchange contact details with them, then you can start to build this person into your professional network. When you get home from the conference, email them to follow up and to establish communication. Now would be a good time to send them any of your papers or a copy of your talk or poster if they said they wanted to see them. 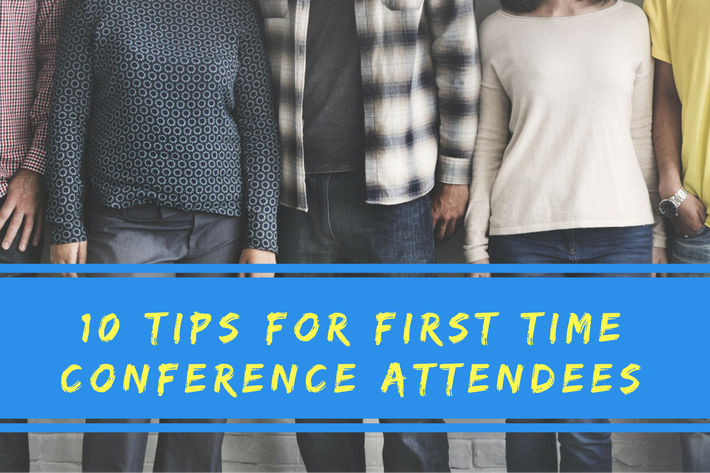 There is a lot to remember when attending your first conference, but try not to worry. Conferences can be fun as well as helpful for your career!